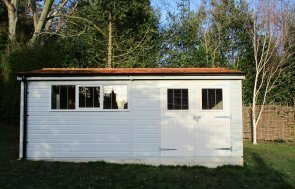 This Superior Shed has been installed at the bottom of our customer’s garden in Burnham Market, Norfolk to use as a hobby room for the customer to retreat to and spend some quiet time on their woodwork inside. The size of this shed is 3.0 x 3.6m, giving the customer enough room to work, as well as enough room to store their equipment as well. The apex roof has been covered in cedar shingle tiles for a natural feel, and the Georgian windows add to this traditional country feel. 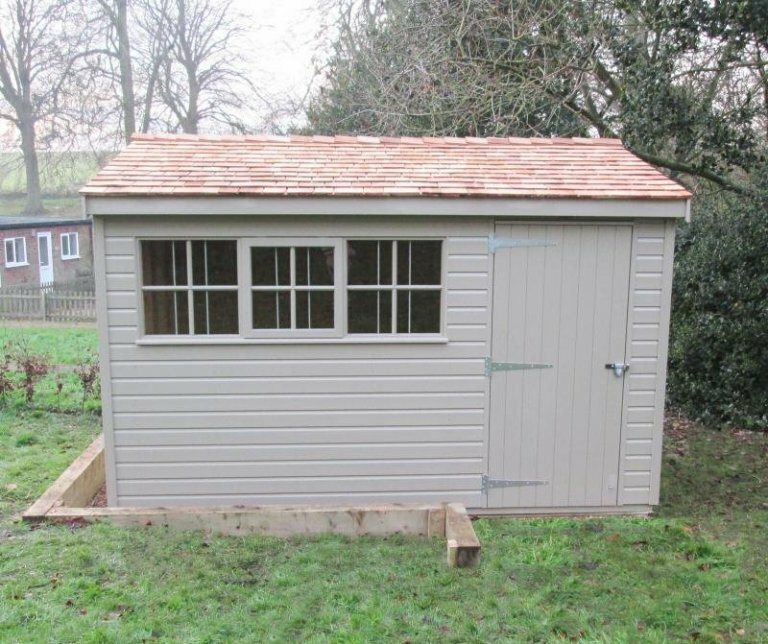 The colour of this shed is Taupe, which is a neutral colour from our Valtti Paint Range that blends in nicely with the colour of the customer’s house. Inside, the customer has opted to have a workbench under the windows to work on, and there is also a security pack, which consists of a seven lever lock, a heavy duty sliding bolt, security screws and stainless steel window bars, all to keep the customer’s projects and equipment safe inside. If you would like any further information on our Garden Sheds, please call us on 01760 444229, or come and visit our Norfolk Show Centre and HQ, which is located between King’s Lynn and Swaffham on the A47.